These are reflections from a recent trip to New York around Saint Patrick's Day. Twice terrorists attacked the World Trade Center, the second being the attack on 9/11, but often forgotten is the first that occurred on February 26, 1993. That attack killed 6 people and injured a thousand more when an explosion erupted in a garage. The first attack was the first warning of what laid ahead. The 9/11 memorial venerates those who died in both attacks and reminds us of what happened so that this day should never be forgotten. Like the Phoenix rising from the ashes, four new versions of the World Trade Center will surround the 8 acre ground featuring two waterfall ponds with the names of those who passed away. The memorial is strictly simplicity; hallow ground that merely allows the reflection of those who died. The buildings will include one World Trade center, a massive 1776-ft height when completed, making it the largest in the United States. The 1776 feet is symbolic of the year of our birth and the building sticks up in the air like a middle finger to those who destroyed the original. Somehow, the memory seems to have drifted farther and farther from our mindset and there are many who actually view us as the guilty partner. As we leave Iraq and Afghanistan, many Americans may feel what happened over the past decade was more worthless than worth the effort, and even the death of Osama Bin Laden has done little to ease the losses over the past decade. Yet, the memorial reminds us that evil exists and it is just a moment away. There are no rules when it comes to world diplomacy as anarchy and violence coexist. Peace is but a wish whereas war is the permanent state of humanity. Someplace, somewhere, there exists the rumors of war coming or actual wars occurring. 9/11 stands a reminder that we are under siege and the imperfect democracy, forever targeted. Saint Patrick cathedral on Saint Patrick's day served as a quick break away from the revelry outside. Along the parade route, massive amounts of humanity, some hundreds of thousands strong, celebrated Irish heritage and Saint Patrick's day, but inside the Church, there exists quiet, serenity and peace. A Democratic Presidential candidate observed to a group of rich progressive donors in San Francisco that many of even his blue collar Democratic supporters clung to God and guns in time of crisis during the 2008 Presidential elections. 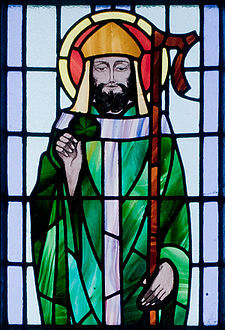 While the left declares war on the Catholic Church, in particular, and religion in general, Saint Patrick is a reminder of permanent things that go beyond the left's understanding of society. For the left, government is society, and all things must be rendered unto Caesar. For the average American, there are things to render unto Caesar, and things rendered unto God, thus limiting the power of Caesar. Madison Square Garden is one of the Holy Cathedrals, not just to sports, but culture itself. It was 41 years ago, but somehow it seems just like yesterday, when Ali fought Frazier for the fight of the century. (We can make the case that this was the sporting event of the past century.) Ali and Frazier represented the divide that existed at that time; Ali representing the fight against the establishment, against the Vietnam War and racism, whereas Frazier became the symbol of the establishment. For Frazier, he was put in a role that he never asked for or even believed. What is rarely known, Frazier helped Ali in many ways during Ali’s exile, and when Ali made him out to be Uncle Tom, Frazier felt betrayed. (As one of Ali’s corner men noted, Frazier was all raging black, and Frazier often noted that he was blacker than Ali and had all black corner in contrast to Ali.) Frazier won the greatest fight ever, and the two would produce 41 rounds of some of the most brutal and greatest rounds in boxing history. On Saint Patrick day, the Garden was alive with a Irish twist as Irish fighter Matthew Macklin challenged the best Middleweight in Sergio Martinez, and like the Garden of yore, the fight atmosphere was electrifying. While boxing no longer carries the imagination that it once did, there are those moments that one is reminded of boxing's past glory. While Macklin came up short, it ended in spectacular fashion with Martinez scoring an eleventh round stoppage against the game Macklin. Sports occasionally become part of the larger culture and like Religion, it is a reminder there is more to our culture and society than government. Government is but one player in society, and there are those moments we need to be reminded of that, whether it is celebrating the Saint Patrick day parade, spending a few moments in a Cathedral reflecting, or enjoying a sporting event in one of the great arenas.